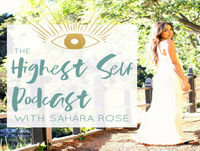 Author and Wellness Personality Sahara Rose IG: @IAmSaharaRose is the fresh young voice for the modern spiritual movement. In her podcast, she shares inspirationally real stories about how millennials have tuned into their unique gifts and blossomed into their highest selves. From understanding your mission on this planet to sharing it with the world, this podcast is the spiritual friend you wish you had, who lifts you up and gets you on all levels. Namaste and welcome.